Now that the fabulous spring weather is finally starting to arrive, we bet you’re itching for a way to get the kids out of the house! Why not go on a trip to historic Gettysburg? Beautifully rich in culture and history, Gettysburg offers a range of activities that shapes up to be fun for the whole family! So, hop in the car and come on over – we bet you’ll even come back for more! Once you get to Gettysburg, what do you do? Well, we’ve put together a list of six activities, both educational and just plain fun, for you to spend the day (or the weekend!) exploring historic Gettysburg. Of course, we want you to visit us at Gettysburg Battlefield Tours! Enjoy a guided walking or bus tour to learn all about the battle that redefined our country’s history. We offer a variety of mix-and-match tour options through our Value Plan, so choosing tours has never been easier! Spending the night? Better sleep with one eye open after one of our haunting ghost tours! If you have older kids (or kids who like a good ghost story), there’s no better place than historic Gettysburg for a bone-chilling tale or two! Mourn the death of Jennie Wade, the only civilian casualty in the Battle of Gettysburg, or hear the wails of the poor souls trapped in the 150-year-old haunted orphanage. You never know what you may find within these walls! 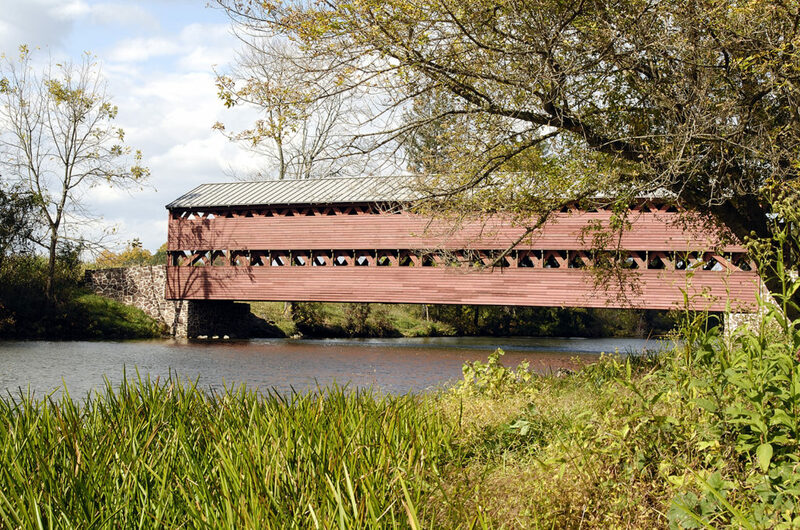 Built in 1852, the Sachs Covered Bridge was used in 1863 by both the Union and Confederate armies to cross in and out of Gettysburg. Snap a picture with the beautiful springtime landscape, then return (if you dare) after dusk on our Gettysburg Haunted Bus Tour and see if you can capture one of the tortured souls who lingers! Infamous for being the bloodiest battle in the Civil War, the Battle of Gettysburg cost more than 3,500 Union soldiers their lives – to honor the troops, the Gettysburg National Cemetery was established. Stand in the exact spot President Lincoln stood to deliver the historic Gettysburg Address and give a salute to the vast resting place of some of the bravest soldiers the country has ever known. After all that walking (and learning! ), your kids deserve a sweet treat! Stop by the Cannonball Malt Shop, a local favorite for historically delicious classic malted shakes and ice cream sundaes. Of course, everything in historic Gettysburg has a fascinating story – look below one of the upper windows of the shop to see a Civil War era cannonball still stuck in the wall! These are only five ideas from a nearly endless list of exciting sights to see and adventures to be had in historic Gettysburg! Call us today at 1-877-680-TOUR or buy your tickets online now! We can’t wait for you and your family to come visit us! Posted in Blog, Interesting History, Things To Do and See and tagged Ghost Tour, Sach's Covered Bridge, Soldiers' National Cemetery, Value plan on March 25, 2019 by Gettysburg Battlefield Tours.